1978 called, they want their invaders back! Released one year after the Japanese version for reasons unknown. 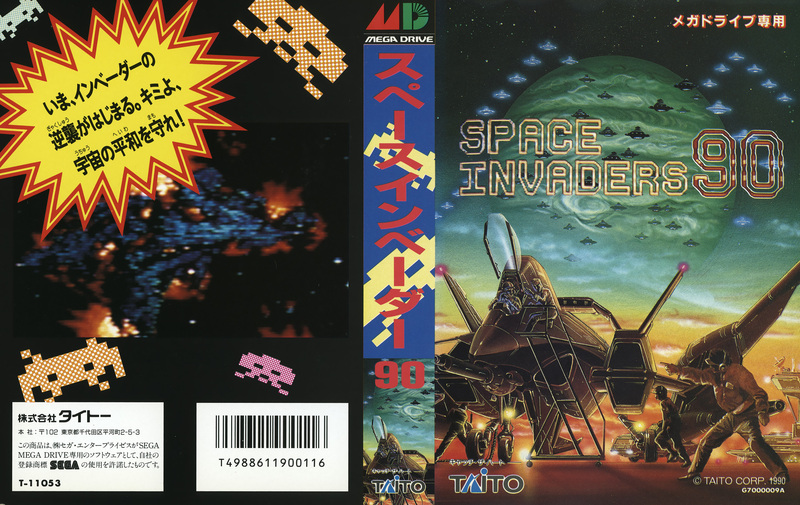 Space Invaders 91 (or Space Invaders ’90 as it’s known in Japan) has a killer upbeat soundtrack that sounds as good as any music I’ve heard on the Genesis. There’s an energy and enthusiasm running through the ten tracks that makes for perfect listening on its own. When paired with the game, however, the music is almost too lively. 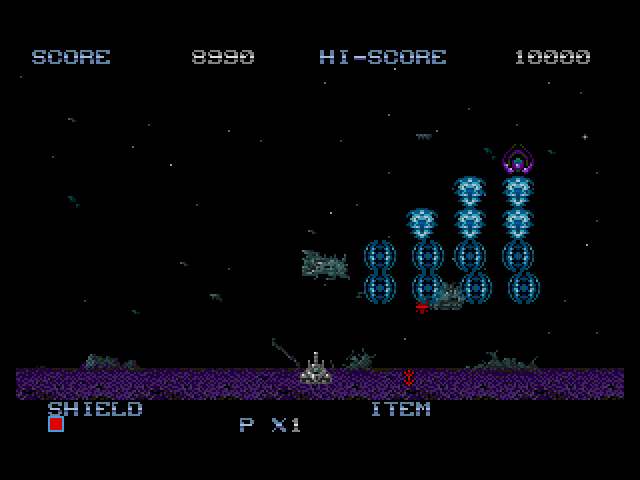 It stands at a contrast with the leisurely paced back-and-forth shooting that’s Space Invaders‘ modus operandi. It looks like the aliens are actually shooting earth. The future is 1991. The fantastic tunes beg to be placed in a different, more exciting game, and so do I. I’ve reviewed the original Space Invaders once before for the SG-1000, and while I can appreciate the game’s legacy, I didn’t grow up with it and thus have no nostalgia towards it whatsoever. 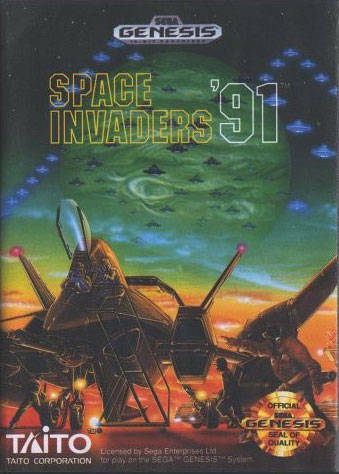 Space Invaders 91 seems to understand that there were many kids like me and attempts to combine the Space Invaders formula with elements of the modern shoot-em-up. Special weapons, all new levels, and a shield on the ship make for a slightly different experience, but none of the additions succeed in making the game feel like a true heir to the original. In the original Space Invaders, you control a spaceship that has to destroy rows of descending alien invaders before they reach the ship at the bottom of the screen. The ship is limited to horizontal movement, so it’s unable to fly vertically towards the invaders. There are four large shields between you and the invaders that you can hide behind as they shoot at you. When the aliens shoot the shields, they slowly erode away; lingering behind them like a coward does you no favors, though you can shoot through them to take out hard-to-reach invaders. UFOs occasionally appear at the very top of the screen and, when shot, provide a large number of bonus points. As the number of aliens decrease, the remaining ones move faster towards your ship. If they reach your ship, game over. If you destroy the entire fleet, onto the next round, same as the last. Even the outer reaches of space wept when Prince passed. 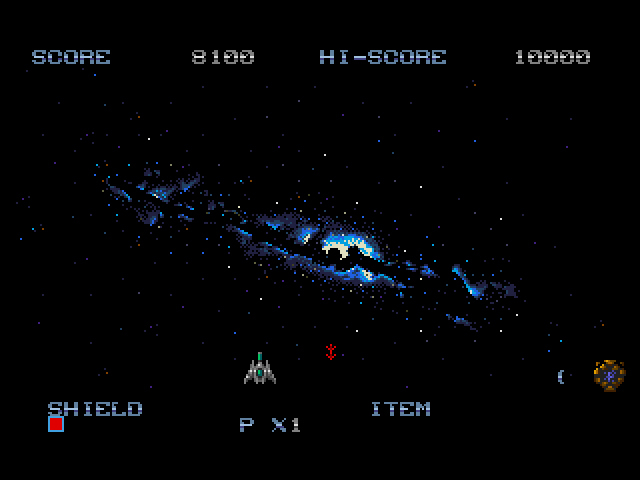 In Space Invaders 91, you control a spaceship that has to destroy rows of alien invaders from reaching you at the bottom of the screen. Your ship can only move horizontally, not vertically. The four shields have been removed for a personal shield that allows your ship to get hit five times by enemy projectiles. 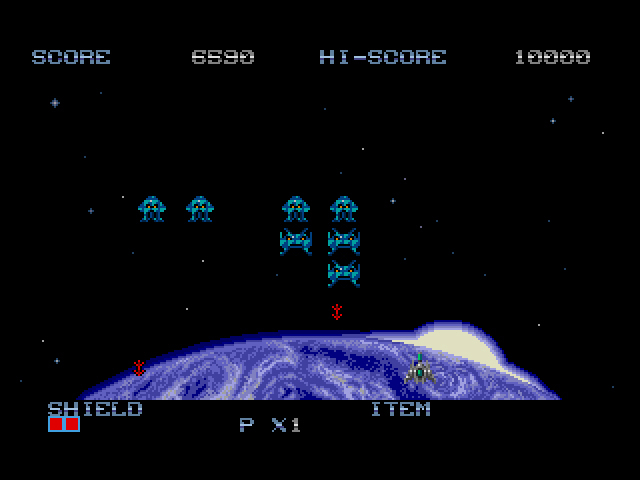 UFOs occasionally appear at the very top of the screen and, when shot, drop a special weapon. Depending on the round, the weapon can be anything from a shield that protects you from enemy fire to a homing bomb that locks on to specific enemies. All special items have a limited number of uses and disappear quickly. As the number of aliens decrease, the remaining ones move faster towards your ship. If they reach your ship, you lose a life. If you destroy the entire fleet, you move on to the next round, slightly different than the previous. 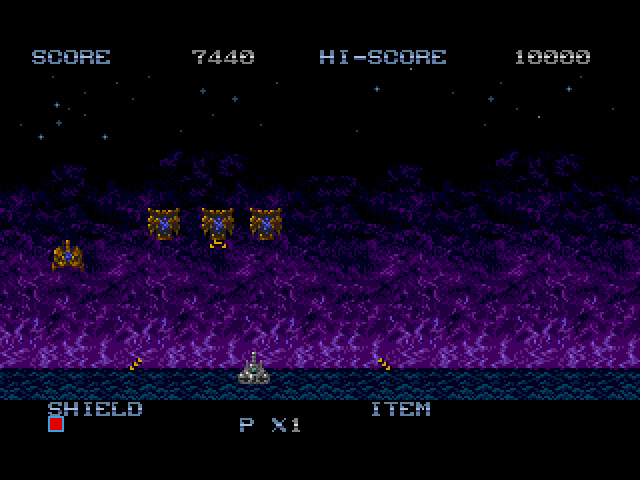 Each level takes place on a different planet with slightly varied enemies. The pixelated aliens from the original are here, but so too are amorphous sea creatures, space bugs a la Galaga, and vengeful amoebas. While you mostly stay in space, occasionally you’ll fight on the ground in a land vehicle. 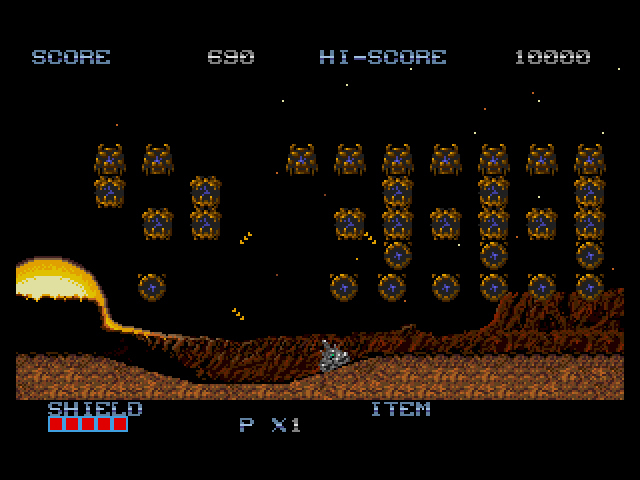 On these ground levels, the terrain will sometimes bend in the middle, which forces you to shoot diagonally. Space Invaders was a huge success because nobody had played anything quite like it before. The changes made to the formula in Space Invaders 91 are poorly implemented, and are features you’ve seen in every other shoot-em-up made in and before 1991. The special weapons are solid, but the limited number of times you can use them renders them pointless. The stage backgrounds resemble bad paintings; so much so, that I would have preferred the constant blackness of space behind the aliens rather than surreal landscapes you might see in a Carl’s Jr. The shifting terrain is neat the first time you see it, but doesn’t actually enhance the game. Only 16 bits of raw blast processing could alter such formidable terrain. Space Invaders 91‘s conservative changes seem designed to not offend old fans, yet still bring in new ones somehow. So who’s the game’s intended audience? For an update, it plays too much like the original, yet not enough like the original for fans who just want to play a 16-bit version with upgraded graphics. The different levels, the intense soundtrack, and that “’91” in the title: Taito desperately wants you to think this is a modern and fresh take on your parents’ favorite classic arcade game. But no amount of visual trickery or aural ear candy can give Space Invaders 91 what it desperately needs: a purpose. I can understand having no Space Invaders Nostalgia. But I thought this was a pretty good “sequel’. It remained at its core, Space Invaders while adding interesting new elements. I only ever rented this. But it was alright to me. And I also reallllllly want to know what kind of Carl’s Jr.’s you’ve been to? The Carls Jrs in Tucson have quite the interesting decor. Just did an internet search, ya sure does, that is unlike any Carl’s Jr. Locations I’ve ever seen. Haven’t seen that elsewhere. No wonder I didn’t get the reference lol. Also some sources say that Super Space Invaders on SMS and Game Gear are the same game as this, never played them though. I did play this first at the arcade though. At the time it seemed like an odd but welcome home arcade port. Of the home console remakes on 8-16 bit systems, this is probrably the favorite of the ones I’ve played. Looking at screenshots for these, I’d say they differ from Space Invaders 91. Sega Retro doesn’t group them together either. It’s a shame this is so unadventurous. I don’t have any particular affection for the original, but Space Invaders Extreme on DS proves the potential of those creaking old foundations. 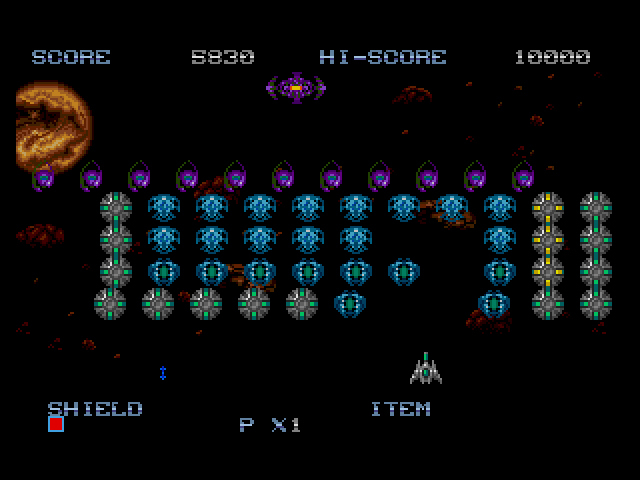 It’s one of my favourite score attack-type shmups despite sticking with the same left/right single screen basics. I’ve never played any version of Space Invaders other than the original and this one, so I’ll be interested to play Super Space Invaders, among several others I’m sure. Dylan, might I recommend the Game Boy version? It’s a solid conversion of the arcade original, shrunk down for the GB’s tiny screen, but it’s also enhanced for the Super Game Boy, so you can play a nice updated version with more colorful graphics, great sound, and an experience much closer to the arcade original. It’s actually quite a good port. I’m with you, though. I have zero nostalgia for Space Invaders. By the time I was playing my first arcade shooters, they were Galaxian and Galaga, the latter of which I still love dearly, but even its predecessor feels dull by comparison. Still, this would be a neat addition to the collection, though I’d prefer the TurboGrafx “Galaga ’90” instead, methinks. Galaga was my first arcade shooter as well. Still love it too. I’ll check out the GB port of Space Invaders, thanks for the rec!